I like to think about the original explorers. The guys commissioned by their countries to seek new lands and report back. Can you imagine what flavors Christopher Columbus, Ponce de Leon, Bartolomeu Dias, or those who went towards Southeast Asia like Henri Mouhot and Carl Bock were surprised with? Think about it. Imagine being out to sea for weeks at a time, no terra firme in sight. Then landing in what we now know as Florida, Thailand, Borneo, Puerto Rico, Mexico or Panama. You find yourself sea-weary, possibly sick and hungry for something other than a MRE. Now visualize the locals preparing their meals of the day. What would you find? What will you love? 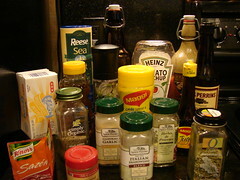 I do my own exploratory missions in the spices and condiments aisles of my local stores. My arsenal of spices grows and grows with every visit; sometimes to refill my already favorites and others to get to know some new ones. 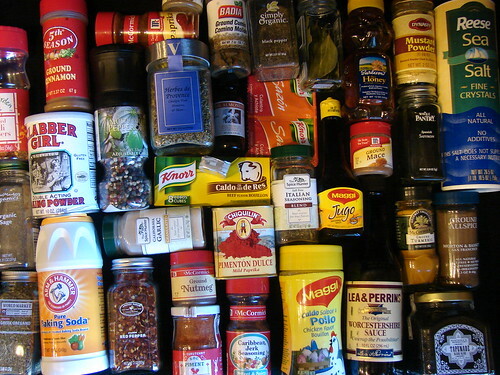 The picture at the top is my current collection of dry spices. Well, what I was able to fit into the frame. Let me tell you about some of my favorites. Let me do this all professional like, from left to right. heh. 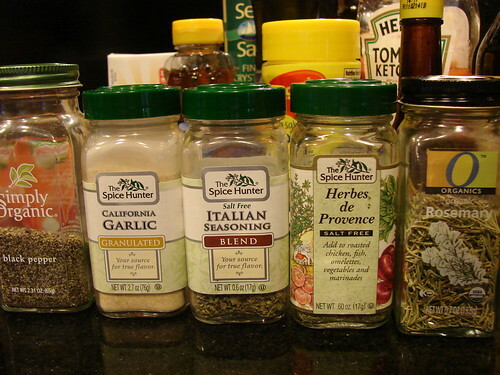 Garlic – I use granulated garlic very seldom, but I always keep it on hand. Check out how I save time to use fresh garlic. Herbes d’Provence – aka Anamaris’ CRACK! If you haven’t tried this stuff, do! 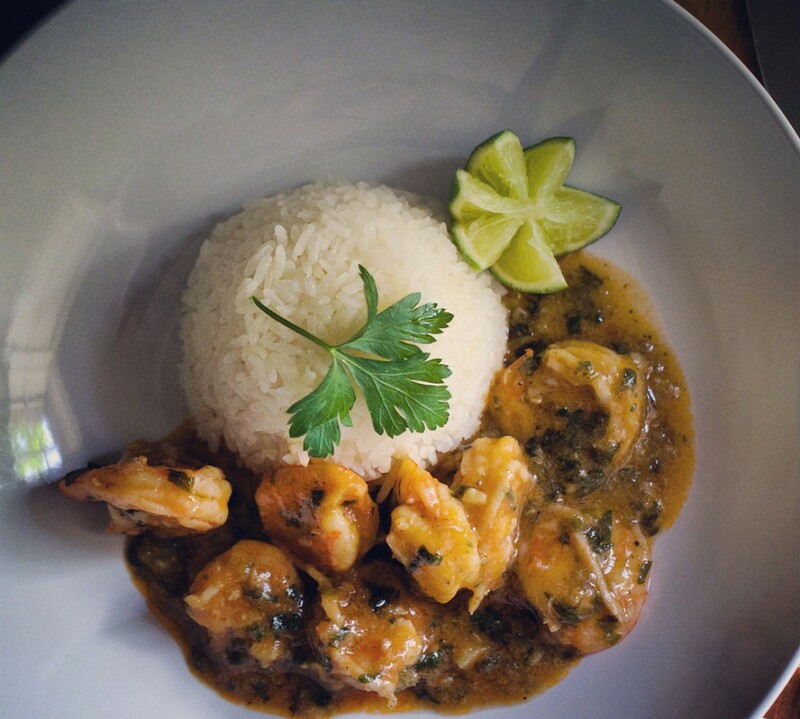 It is aromatic, sweet and savory goodness. Rosemary – for chicken, steaks, pork chops, veggies. Awesome! Equally as important, but with that Latin flava I love. 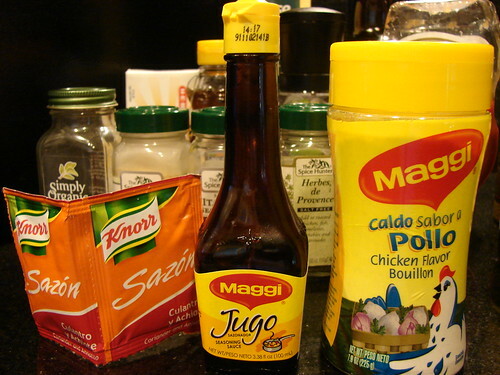 Knorr’s Sazon Culantro y Achiote – I use this for Arroz con Pollo and other rice dishes. It also makes a mean roasted chicken. These round things off nicely. Ketchup, butter (cuz butta makes everything betta), Worcestershire, vegetable/canola oil, sea salt, and extra virgin olive oil. 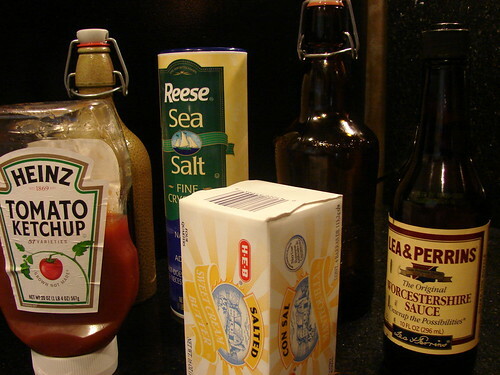 The 2 odd bottles next to the salt started off as snobby beers and are now great receptacles for oil. Check out the posts about garlic and habanero sauce. Both of those are always in the fridge. What’s in yours? I think this was an EXCELLENT idea to show the different spices you use! I’ve always wanted to see what chefs have in their cabinets! Thanks for sharing!